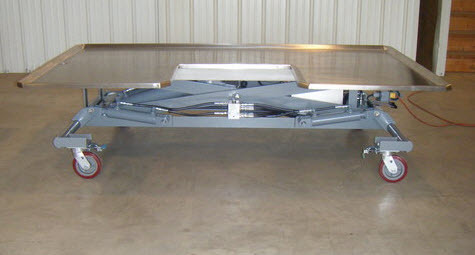 As a manufacturer of large animal lift tables for veterinary use, the bulk of our tables are used for large animal surgery, but some are used for necropsy (post mortem autopsy) and MRI scanning. Besides lift tables, our product line also includes other large animal related transporters/carts, and metal fabricated items related to the equine (horse) surgery process such as metal gates and special use metal doors. Our products are used worldwide in private veterinary hospitals, universities, zoos and research facilities. Our Export Credit Insurance policy with the Ex-Im Bank has been in place since 2011 and the export credit policy has been instrumental in growing our export sales. We have specifically been using this in the most recent 12 months to offer to distributors/resellers in India and Mexico. Without the assistance of Ex-Im Bank, we would not be able to offer open credit terms to our international customers.